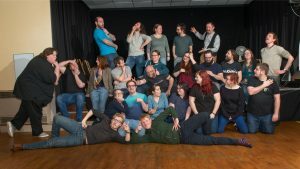 Meet the team kneading and proving Peculiar’s next production Arcadia ready to rise to the stage in February 2019! I’m John, the lighting designer, and I’ll be cooking up a storm of light. Arcadia has some moody scenes and different times of day, so I’ll be making the sets come to life with a bit of technical magic. What ingredients do you need as lighting designer and what gets your taste-buds tingling the most? An eye for detail, creativity and some technical nous. I do really enjoy a dark and moody scene – think dark clouds back-lit by the setting sun, a wheat field in the foreground. Oooooh, foreboding. I crumbled into theatre just over four years ago, inspired by a lack of anything to do and an inkling to try something new. The shove came from my wife as she was in far flung lands and a friend of hers shared an advert for actors in Wyrd Sisters. I’ve been inspired by most of the people I’ve met since, but particular mentions go to our current director, Hannah and previous directors, Ellen and Amy. How did you find the audition process? Well organised and with enough detail to know exactly what’s required, but not too formal. Savoury every time except for pancakes. A pie with an interesting flavour. Traditionally northern and quite boring on the outside, but once you’re through the thick crust, there’s something quite warm and mad on the inside. Shooting people on the internet, rocking out and sliding down snowy mountains – but not all at the same time (maybe 2 at once is ok). Is this where I can only eat one thing forever because I’m trapped on an island? Oooooh, that’s tough. It’s either pizza, Christmas pudding or sushi / sashimi. 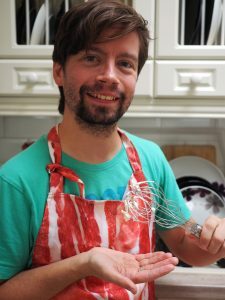 Who is your favourite baker in GBBO 2018? I’m kinda rooting for Briony because of a tenuous I-know-her link (She served me beer at university #StAidan’sCollege #Durham). Rahul is amazing though, what a guy! Some sort of social media appreciation of the lighting or photography, I’m so self-centred!